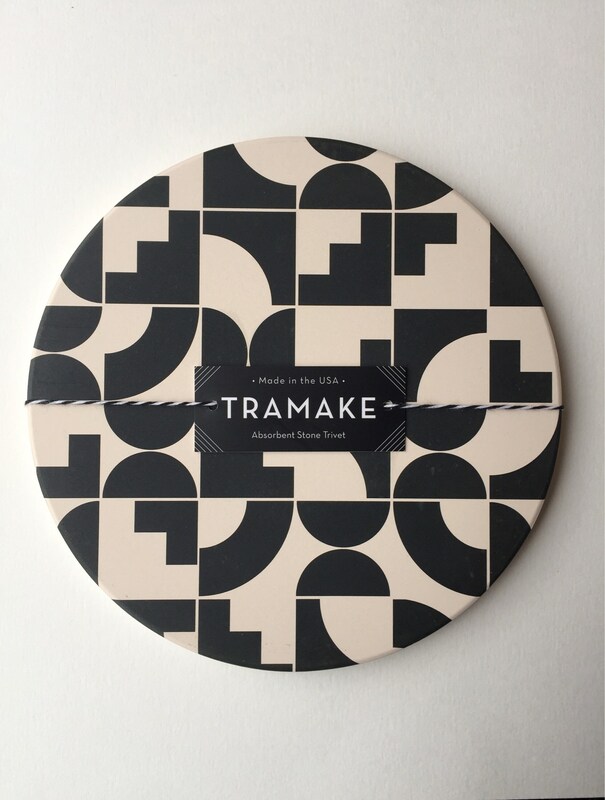 Tramake's original SHAPES design is a black and white geometric pattern with a mod vibe. 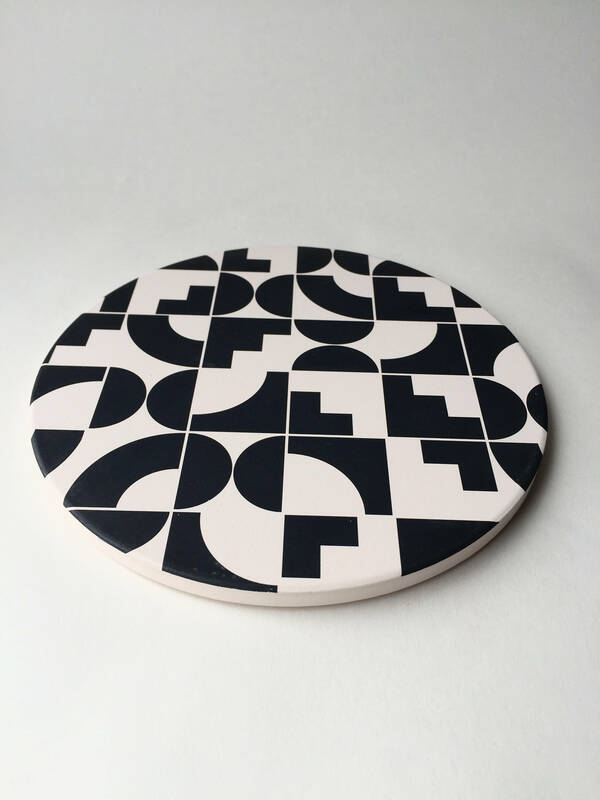 The designs is printed on an absorbent ceramic trivet; this stoneware trivet is ready to hold a growler or wine bottle, hot dish from the over or tea pot, or a potted plant. 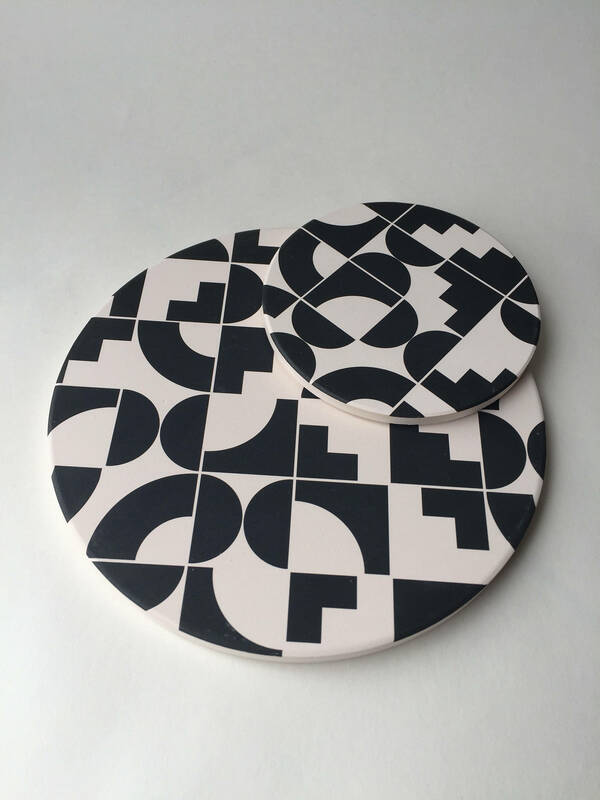 We love to use these as a large coasters too. 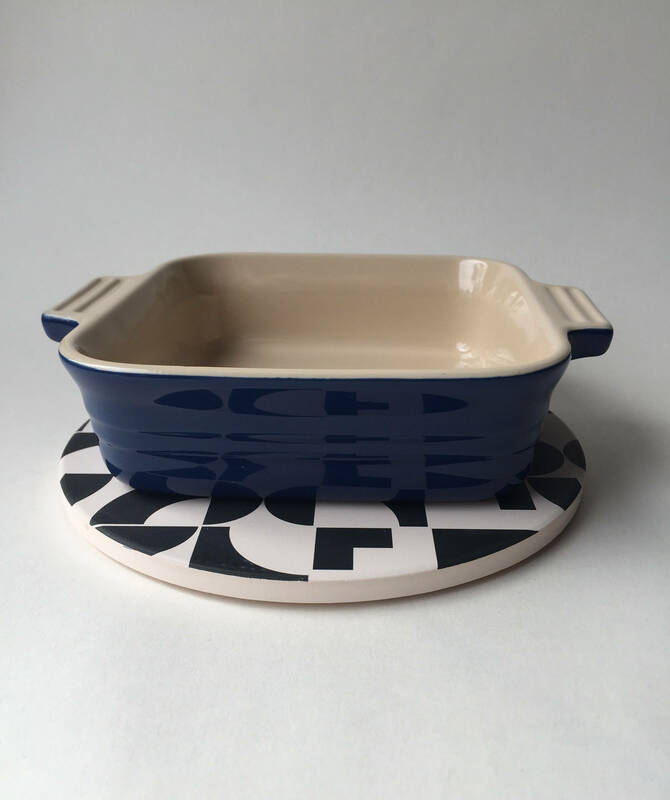 The thirsty stone will both absorb moisture and hold hot dishes. Printed surface is fade resistant. A thin cork layer on bottom protects surfaces from scratching and provides grip. 7" stone trivet - cork underside. 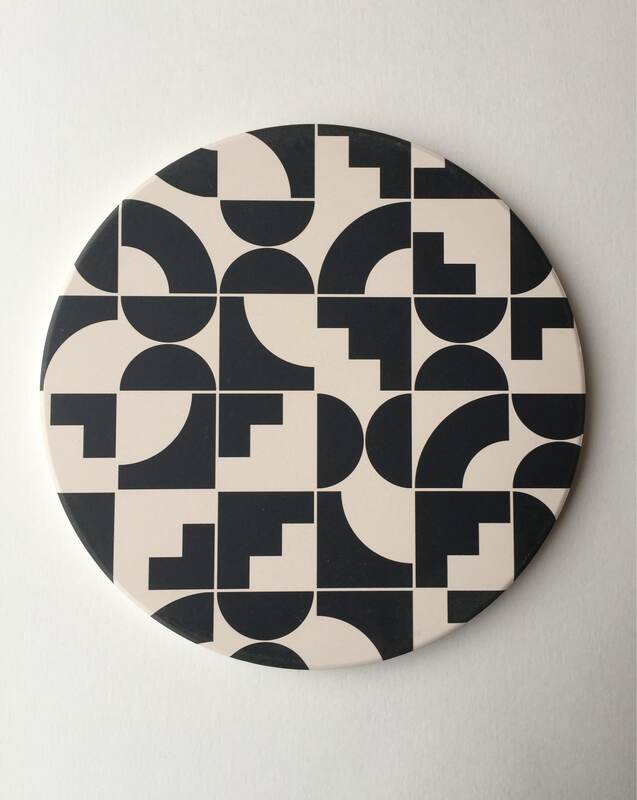 *This listing is for one trivet. Add matching coasters seen in pics for a great set! Available as an add on in drop down menu or in their own listing. CARE: To clean stone coasters or trivet: wipe or rinse and allow to air dry cork side up. Make sure coasters are clean and dry before stacking. Wipe up or rinse spills to prevent staining. In case of staining, stains can be treated by preparing a mixture of one part bleach to three parts water. Soak overnight. Rinse thoroughly and allow to air dry cork side up. May be repeated for stubborn stains. All major credit cards and Etsy gift cards accepted. Items will ship in 1-3 business days unless otherwise marked in description (i.e. made to order or backordered). Items will be shipped USPS first class mail unless upgraded to Priority at time of checkout. You'll be sent a tracking number when it's on the way to you! Contact us for rushed shipping. In the unlikely event that you receive an item with an issue, please contact us within three days of receiving the delivery, we'll help you work it out! We will accept returns of unopened items. Items must be unused and in perfect condition. Return shipping is the buyer's responsibility. Original shipping charges will not be refunded. In the event your package arrives damaged, an insurance claim needs to be made in a very timely manner. Please contact us as soon as possible. Be sure to keep the item(s) in the box the way were received with visible damage. The shipper will require documentation. Thank you! This is such a mod set. I bought it as a gift, and the packaging is perfect for gifting. Also came really quickly. Overall awesome purchase and great shop. Love it! The black and white pattern is fabulous.